Ear swelling can be caused by an infection of the outer or inner ear, or a skin infection like cellulitis. Other causes of a swollen earlobe can arise from irritation from allergies or trauma from an injury or piercing. Read below for more information on causes and how to reduce ear swelling. Swelling is the result of fluid buildup that gets trapped in the body's tissues. The trapped fluid often makes the affected body part appear larger than normal, thus a swollen ear can be easily identified by comparing its size to the size of the other ear. The entire ear may be affected, but it is possible for just a portion of the ear (such as the earlobe) to be swollen. If you notice any of these swollen ear symptoms, make an appointment with your doctor promptly in order to follow-up on your symptoms, get a diagnosis and receive appropriate care. Outer/external ear (pinna): This consists of the outside portion visible to the eye and a canal that runs from the eardrum to the outside of the head. Middle ear: This consists of three small bones (the mallus, the incus, and the stapes) that connect and transmit sound waves from the outside world to the inner ear . Inner ear: This consists of nerves and receptors necessary for hearing and balance. 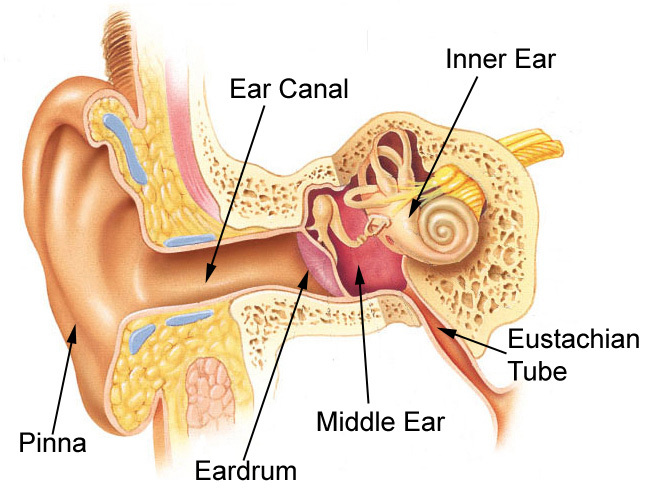 Other components: The ear is also composed of a tympanic membrane (eardrum) that divides the outer ear from the middle ear, and a Eustachian tube. The Eustachian tube is a structure that links the middle ear to the nose and helps equalize pressure in the middle ear. See this image for a visual representation of the outer, middle and inner parts of ear and its different components. Any condition that causes accumulation of fluid in these tissues of the ear will result in swelling. A swollen ear may not seem serious initially, but without prompt medical follow-up and care, your symptoms could worsen. The majority of causes of a swollen ear stem from inflammation and infection of the different components of the ear. Infection of the outer ear is known as otitis externa and infection of the middle ear is known as otitis media [2,3]. Bacterial: Because the ear is open to the outside environment, it is very susceptible to bacterial causes of infection. These organisms are often present on the skin and easily infect the tissues of the ear. This causes entrance of fluids into the tissues that result in inflammation, swelling and other symptoms. Viral: Since the ear is also directly connected to the nose, viral illnesses such as the cold or flu can cause congestion and swelling of the nasal passages, throat, and Eustachian tubes that can also result in inflammation and swelling of the ear. Conditions that result in excess moisture inside the ear canal create an environment ideal for bacterial and fungal growth. Environmental: External factors such as swimming and heavy perspiration put moisture directly into the ear canal . Repeated exposure can result in bacterial growth and future infection that leads to swelling of the ear. Structural: Some people have narrow ear canals that make drainage of moisture more difficult. This structural anomaly causes blockage that traps water and promotes bacterial growth and infection that results in swelling. Devices: Items that you put directly into your ear such as headphones or hearing aids can also cause blockage that traps excess water. Environmental causes of a swollen ear may be related to lifestyle habits or certain exposures. Trauma: Practices such as excessive cleaning of the ear with cotton swabs or scratching inside the ear with a finger can result in breaks in the skin that allow bacteria to grow. The bacteria can infect the ear and cause swelling and inflammation. Furthermore, trauma can also include causes such as bug bites and piercings. Sensitivity: Jewelry and sometimes hair products can cause allergy and irritation to the skin. Such products can cause allergic reactions to the ear that result in swelling, but these products can also promote infection by breaking the skin and allowing organisms to enter the ear, also resulting in swelling. The list below shows results from the use of our quiz by Buoy users who experienced swollen ear. This list does not constitute medical advice and may not accurately represent what you have. At the onset of symptoms, seek prompt medical attention. In order to minimize or prevent outer ear pain there are many things you can do at home and change in your normal routine. Keep your ears dry: Thoroughly dry your ears after exposure to moisture from swimming or bathing. Practice techniques such as tipping the head to the side to help water drainage from the ear canal and wipe the outer ear slowly and gently with a towel. Do not put foreign objects in your ear: Do not attempt to scratch or dig out earwax with objects such as cotton swabs (Q-tips) or paper clips. These items may not only irritate or break the skin in your ear but can also pack the material deeper into your ear canal worsening blockage and moisture buildup. If your swollen ear symptoms are caused by infection, your doctor will treat your swollen ear by stopping the infection and allowing the ear to heal. Drainage/cleaning: Your doctor will use suction or a small device to drain water and clear away debris, earwax or extra skin. This is necessary to allow for the next step, the antibiotic ear drops, to move freely through all infected areas of the ear. Depending on the extent of blockage or swelling, your doctor may insert cotton or gauze in the ear to promote drainage instead. Ear drops: Your doctor will prescribe ear drops to treat bacteria and fungi as well as reduce inflammation and help restore your ear's normal pH balance . If your swollen ear symptoms are not related to infection, but rather environmental causes such as an insect bite or sensitivity reaction, your doctor will provide you with medications that can soothe the inflammatory reaction causing the swelling.